To celebrate the 25th anniversary of Level 42’s double-platinum hit album Running In The Family, Universal Music are proud to announce the reissues of the album in Box Set, Deluxe Edition and standard formats on October 8 2012. The album’s reissue campaign will coincide with an 18-date ‘Level 42: Running In The Family UK Tour’ throughout October. 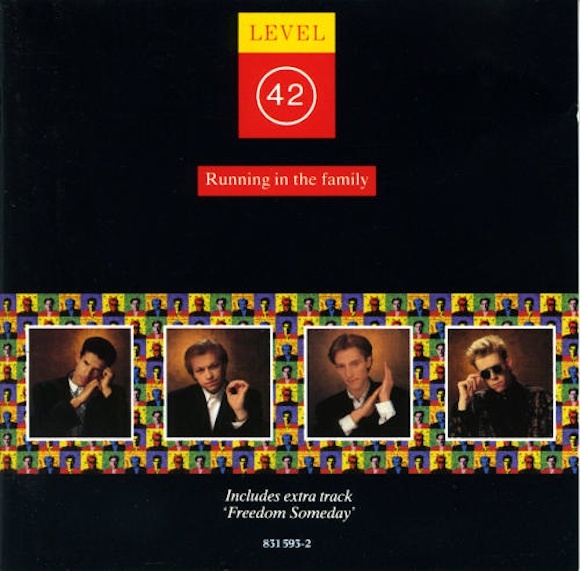 Running In The Family was Level 42’s seventh LP and, following its release on 28th March 1987, became the group’s most successful album, peaking at #2 during a 54 week stay in the UK album charts. It also produced five UK hit singles: Lessons in Love (#3, May 1986), Running in the Family (#6, February 1987), To Be With You Again (#10, April 1987), It's Over (#10, September 1987), and Children Say (#22 Dec 1987). The album’s success in the UK was mirrored across Europe, with the album reaching #1 in Holland, where all five singles became Top 10 hits, while Lessons in Love reached #1 in Germany, Switzerland and Denmark. The reissue of Running In The Family will appear across three different packages; a 4-disc box set, a 2-CD Deluxe Edition and a remastered 1- CD & digital download of the original album. The box set will include the remastered original album and 12” mixes, plus a second disc titled Running In The Family - acoustic re-interpretations 25 years on…, featuring exclusive tracks recorded recently by Level 42’s singer & bassist Mark King. Disc 3 features the band’s celebrated live concert at Wembley Arena in 1987 and, for the time on DVD, Disc 4 contains the documentary Fait Accompli: Onstage Offstage Backstage, documenting a year in the life of Level 42. The DVD is complete by the promo videos for Lessons In Love, Running In The Family, To Be With You Again, It’s Over, Children Say and Fashion Fever. The box set will also come complete with 5 x A5 prints (4 x band members and a replica original tour flyer), a replica 28 page tour programme, a 40 page book featuring photos, memorabilia and a new interview with Mark King. Speaking in July 2012 about the box set’s acoustic recordings, Mark King said, "Having the opportunity to re-visit the songs of an album that meant so much to me, and re-interpret them with the benefit of 25 years hindsight, was a real pleasure. The only rules I gave myself were that I should play them all on an acoustic guitar. I nearly succeeded. I hope you enjoy the 'new' old stuff." For all enquiries (including review copy requests), please contact us. If you feature this story in your publication, blog or site, we'd really appreciate it if you could let us know.